You have recorded your adventures on a GoPro and now you want to edit them to share your not-so-perfect experiences with the world. But, given that the GoPro Studio is non-existent since the end of 2017, you are naturally confused about which app to use. So, if you have been using a GoPro camera, you would need a good software that can help you edit your videos. We have listed the best GoPro editing software for Windows in this post, that are selected on the basis of the number of reviews and their feature. Although GoPro Studio have ceased to exist in 2017, the GoPro Quick software is still alive and kicking. The software especially designed and targeted for beginners, who have no experience with video editors. But, if you are a long experienced in using these software, it will be still be useful. As soon as you start the application, it will automatically start importing content from your GoPro device the moment it is connected to your PC. Now that you have transferred the photos and videos from your GoPro camera to the hard drive, you can begin using Quik to develop time-lapses, add audio, panning effects, and so on. For those looking for some adventure, Quik offers that too! It allows you to add graphs, charts, and speedometers that shows viewers how high you climbed, or how far or fast you went. Bonus – being a GoPro app, officially, it’s easier for you to get your GoPro devices updated with the latest firmware. Videos captured from your GoPro camera needs a powerful and flexible editor like Corel VidoeStudio X10 that helps your videos transform into incredible creations. It offers that ease of use with a spontaneous user interface and learning means making it convenient even for the first timers. This is indeed a great software for personal use. GoPro software comes well-equipped with a range of great features that are more than sufficient for a normal user. There are more than 1500 filters and effects to choose from. Additionally, it also enables you to edit multi-camera videos, modify the speed of the video, and even edit HD and 4K videos resulting in excellent quality movies. What you should not expect is the Hollywood style effects which is not supported by this tool. However, the software is known for supporting the latest formats and technologies that includes turning the 360 videos into standard videos. Again, this tool is a boon for the social media buffs as it helps them to create some amazing videos and upload them directly on the platforms and make an impression among the social circle. You can also save your creations on a DVD. System Requirements: Windows 10, Windows 8, Windows 7, 64-bit OS highly recommended. Well, this is surprisingly a free software with features that are worth $100 by other tools. All you need to do is to create a free account and download. Among its many features are multi-camera editing,0020correction of color and lens distortion, and new media management, and all this at no cost. DaVinci Resolve 12.55 offers non-linear video editing with what they claim as the “world’s most advanced color corrector”. While it comes with a free version, upgrade is available at a nominal price. However, the free version is a complete professional editing and color grading system which is perfect for users working independently on SD, HD and Ultra HD projects. 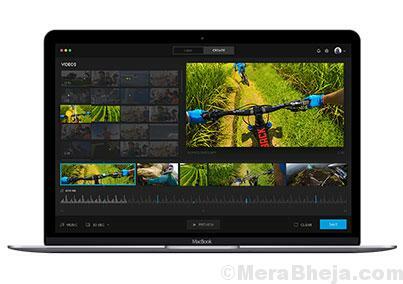 If you are looking for a top-quality video editing software, then Filmora can be your best bet. The brand also claims that they offer the bets software for GoPro. It’s an easy to use software that comes equipped with a range of robust video editing features. With the help of these features you can edit your GoPro videos like an expert. Bonus – the software now comes with action camera options also. Talking of the music library, you can edit your favorite audio and add into your GoPro videos using this software. Once you have finished editing the videos, you can upload them on the social media platforms to be viewed by public or friends. VSDC is specially designed for medium level users. Your search for the best free software may very well end with this software. It’s a non-linear editor which means that it allows you to place any object in any position on the platform and then resize it as per your requirement. Some of its key features are – five different types of visual effects that include color correction, special effects, object filters and transformation, and transition effects, colour blending effects, masking that helps hide imperfections, applies blur effect, or highlights certain aspects of a video, and the option to share your videos directly to social networks or upload on YouTube. For those using it for the first time, they can also use the single-click-instagram-esque filters. Blender is a perfect GoPro editing software and heavily loaded with features like 3D modelling, simulations, animation, game creation, sculpting, and, of course – video editing. What’s exciting about Blender is that it comes equipped with 32slots for effects, images, videos, masks, and audios. It also features a camera, object tracking option and the potential to mask areas. Adobe is a widely known name in the category of software solutions. You know that the tool is to be trusted if it’s from Adobe. So, is the case with Adobe Premiere. There are especially two different tools offered by Adobe that’s well-suited for GoPro and based on your requirements. Adobe Premiere Pro which is specially designed for the professionals and Adobe Premiere targeted for personal use. Adobe Premiere Elements is well-suited for editing videos and special events related to family. The tool organizes video automatically that allows you to locate videos fast sorting by the places they were shot, through albums and other elements. It also allows you to edit each video, delete unnecessary footage, sharpen the videos using Haze Removal utility, correction of color and lighting, and so on. Once done with your editing, you can then share your final creation on the social media platforms. Adobe Premiere Pro, on the other hand allows to access videos and even share them throughout your apps and devices. This software helps you to edit videos that includes phenomenal aspects like virtual reality and 8K footage in local format, almost in any manner. Adobe Premiere Elements – Microsoft Windows 7 with Service Pack 1, Windows 8, or Windows 10. Price: Free Trail available; Adobe Premiere Elements is available at $79.99 and Adobe Premiere Pro is available at $19.99. It’s another software that’s perfect for beginners to start with. Albeit with limited features, it makes it easier for users without any prior experience in video editing. The three key features that this software takes pride in are cutting, filtering, and encoding. The encoding is complete with features, while the app comes with a wide range of options for export, therefore offering you a full access to the encoding process. The app also comes equipped with advanced filters for sharpening and de-noising. What’s disappointing about the Avidemux is that it does not offer any special effects or transitions, and neither a timeline. However, if you are up for some small edits or create quick cuts for your GoPro videos then this app works just perfect for you. For largest projects you may want to use something else. While not many of us have heard about this software, it’s one of the trustworthy apps out there for GoPro video editing. It’s a simple video editing tool with a user-friendly user interface that’s perfect for beginners. Bonus – it’s a multi-platform video editor. It provides a range of fundamental video editing tools, a robust animation system, and video effects. the time effects feature offered by the app allows you to alter, slow down, or speed up your GoPro videos. If you are new to GoPro video editing, you can download and install this software. For more advanced features you can look for more complex tools. It’s perhaps the most powerful apps in the list, although it can be pretty complex for beginners to get a hang of. The best part about this app is that it’s free. Lightworks come equipped with tools of professional quality. When used in the right way, the GoPro movie can appear somewhat like the Hollywood film studio video. Some of the features of this app that can be appealing to the GoPro users are quick export facility to MPEG4/H.264 format to upload on the web, importing, exporting, and rendering of the background, text effects, high accuracy trimming, and the expertise to add voiceovers. It’s a great free option in the current times, strictly for Windows user. WeVideo is a desktop app that can be downloaded and is one of the online video editors that’s available for free. The app is also available for paid upgrades with added features. But, if you only want to carry out some quick editing on the go prior to uploading the GoPro video on the web, you would not require all the added features. The free edition of the software offers 1GB cloud storage and the facility to download the edited footages back to your PC. VideoPad makes for a great alterative to the on-the-verge-of-dying Windows Movie Maker. The interface is similar to the Movies Maker making it easy to use. All you need to do is to simply upload your GoPro images, videos, and audio files and then use the almost unlimited choice of filters and transitional effects of VideoPad that helps you to personalize your work. For those looking for a professional video editor, Hitfilm Express is a great choice. However, it requires some previous experience in video editing, or you may end up being confused. The app offers tools for audio filters, video filters, 3D video support, cutting tools, compositing options, layers, and masking. For advanced features, you can upgrade to the paid version. The system requirements are pretty high-grade that includes an 8GB RAM, video memory of 2GB for 4K UHD, and a graphics card released not before 2012. Video editing will be a breeze on your Windows with these GoPro editing software. So, find the one of your choice from the list and get going with your GoPro video editing.